I borrowed the title of today’s blog from another blogger I ran across while reading about Horseshoe Crabs. Turns out there are lots of people fascinated by these ancient creatures, and The Beach Chair Scientist (http://beachchairscientist.com/) is one of them, so check her out for more information on these fascinating creatures and other topics of the sea. 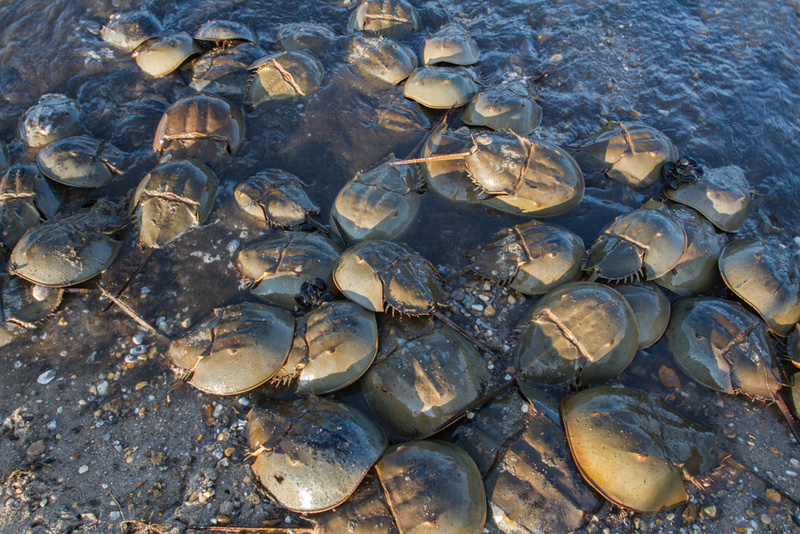 The blog title refers to part of the scientific name of Horseshoe Crabs, Limulus polyphemus, and the fact that this is the time of year when Horseshoe Crabs migrate to beaches for mating and egg-laying. The Delaware Bay region is believed to be home to the largest population of this species of Horseshoe Crab (there are 3 other species in the Pacific) and is therefore the place to be in late spring if you want to witness Limulus Love. 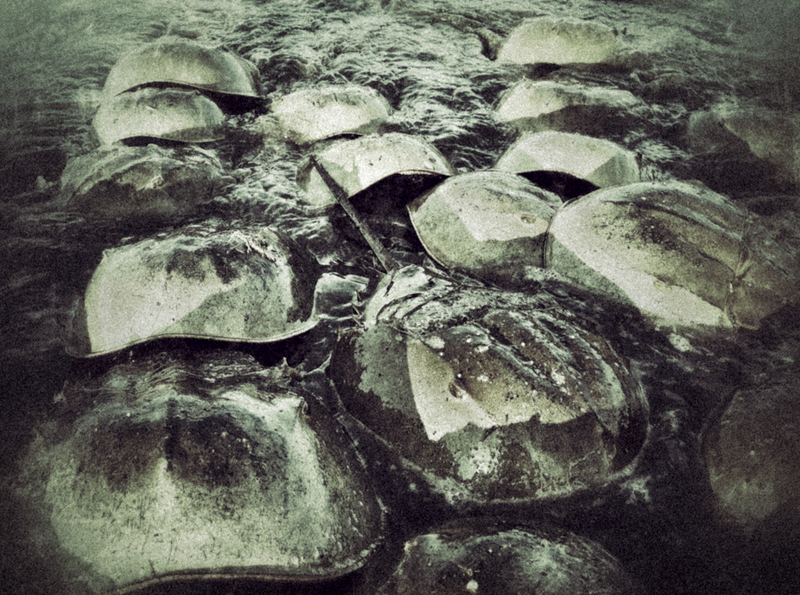 Horseshoe Crabs are ancient arthropods, dating back perhaps as much as 300 million years (way before the dinosaurs). They not true crabs but are more closely related to spider and scorpions. Their anatomy is fascinating and you should check out some of the other web sites for details (also http://www.ceoe.udel.edu/horseshoecrab/index.html). They use their tail (telson) to right themselves when flipped over (although it is not always successful). Two large compound eyes are located on the front part of the shell (prosoma), with other light receptors scattered elsewhere over the body. The eyes are quite sensitive to low light and can help them find mates in the dark waters. Underneath are five pairs of legs, the first pair modified in males to be claspers for grabbing the edge of a female’s shell during mating. The last pair of legs are called pusher legs and have a leaf-like structure at the tip used for pushing and clearing away sediments as the crab burrows. There are two small chelicera in front of the walking legs that help guide food to the mouth, which is the bristly area between all the legs. 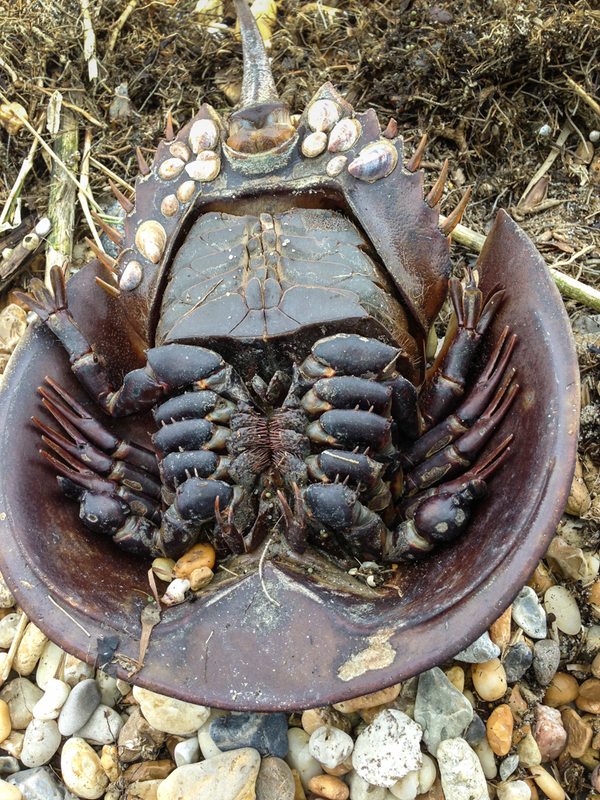 Horseshoe Crabs shed their chitinous exoskeleton as they grow, increasing in size about 25% each time they shed. It takes 16-17 molts over a period of 9-11 years to reach sexual maturity, with females being much larger than males. For most of the year, Horseshoe Crabs are out at sea, feeding on marine worms and softer shellfish such as Razor Clams. 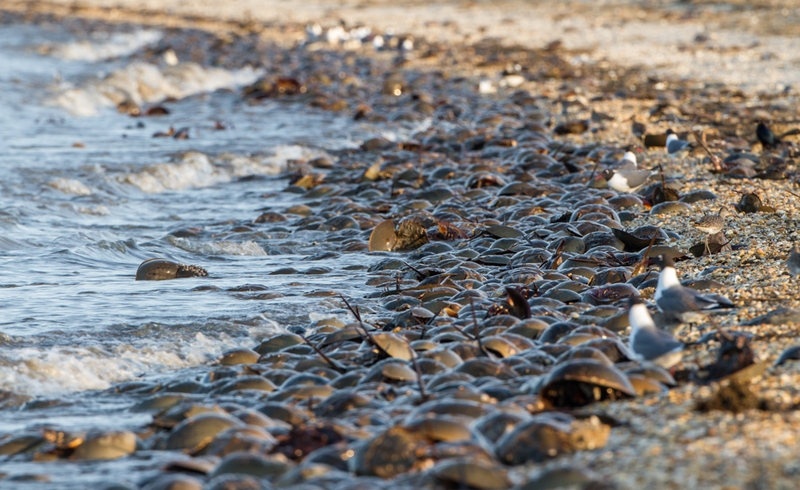 But every spring, adult Horseshoe Crabs migrate to shallow waters to breed. 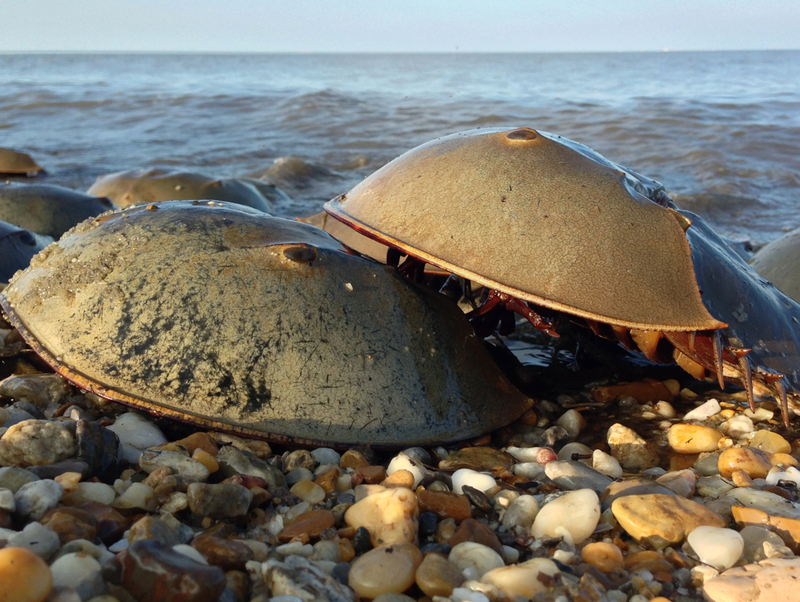 Annual census data highlights Delaware Bay as the most important spawning ground in the world for American Horseshoe Crabs. 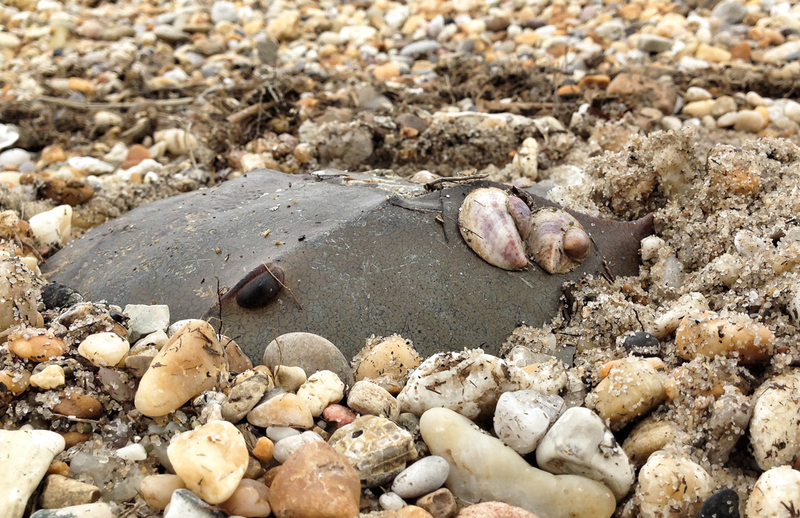 The 2011 survey estimated well over a million Horseshoe Crabs utilized these critical beach habitats. 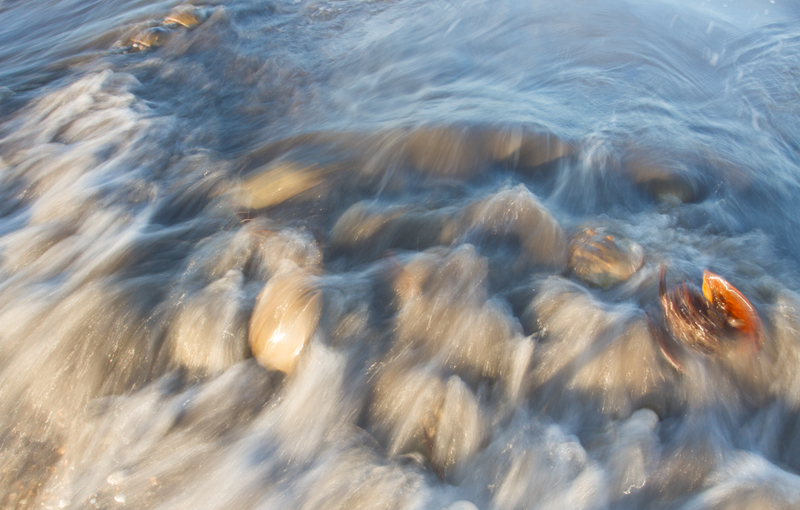 The peak of spawning activity usually occurs several days around the new and full moons of May and June and coincides with the high tides. During breeding, the smaller males couple onto a unattended female as she digs a shallow nest at the tide line. There may be several males in attending each female since the ratio of males to females on the beaches is about 3 to 1. 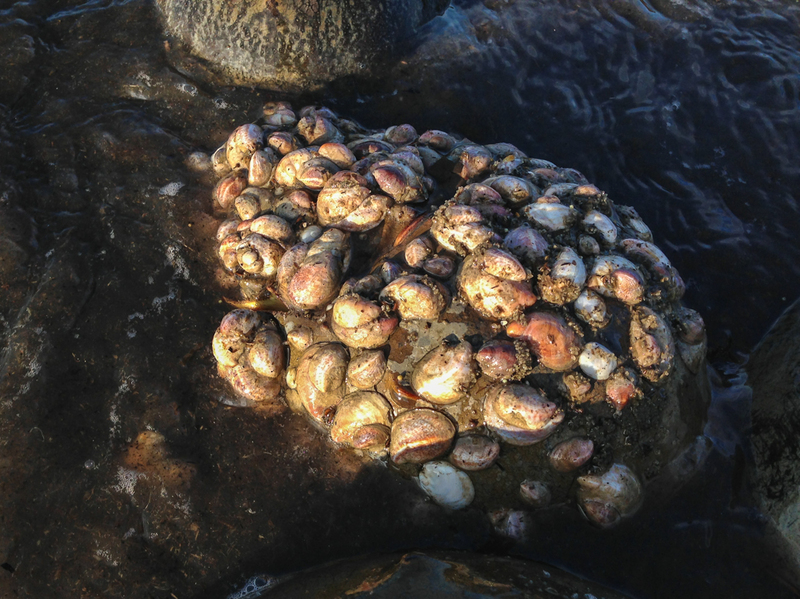 The female releases several thousand eggs while the male(s) release sperm and the eggs are fertilized externally. 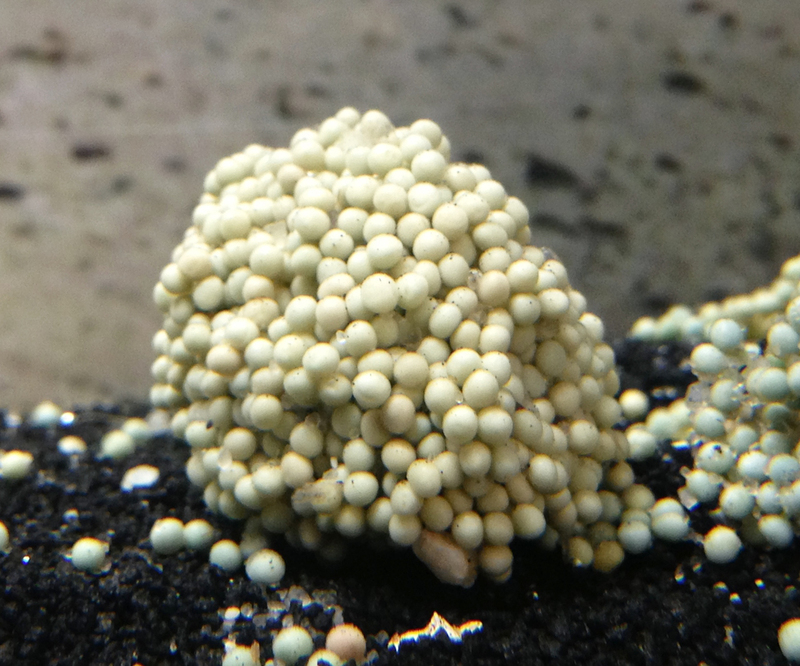 Each mature female lays up to 20 clutches totaling up to 90,000 eggs during the spawning season, of which fewer than 1% will make it to adulthood. The eggs are laid in clumps, but I only saw one on the beach. 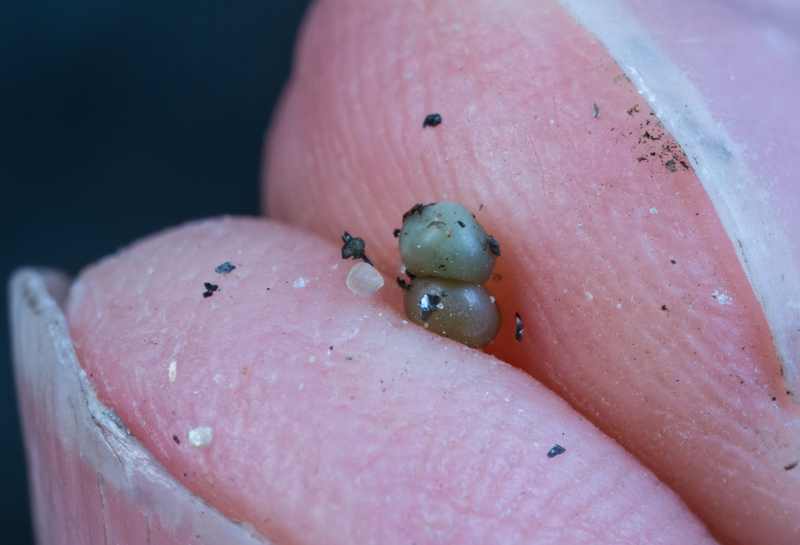 The tidal action plus all the digging from mating crabs tends to bust up the clusters so the beach is covered by millions of loosely scattered greenish eggs about the size of a sand grain. Back at Slaughter Beach the next morning it was low tide with a windy, gray sky. The stark scene had the look of devastation, with dark, motionless clumps scattered as far as the eye could see. But most of the crabs were still alive and with the next rising tide, would begin the ancient ritual again. 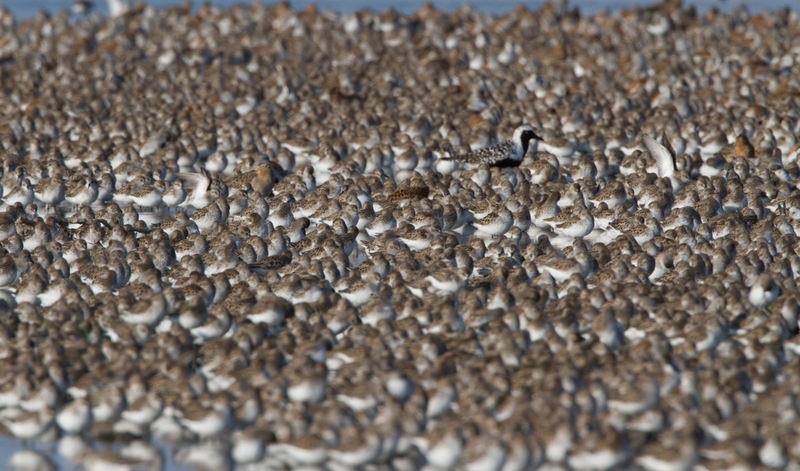 This superabundance of fat and protein rich granules sets the table for one of the greatest bird feasts in North America – the annual migration of hundreds of thousands of shorebirds through Delaware Bay. This area is a critical staging area as these birds make their way thousands of miles from their wintering grounds on the beaches of South America to their nesting grounds in the Arctic. 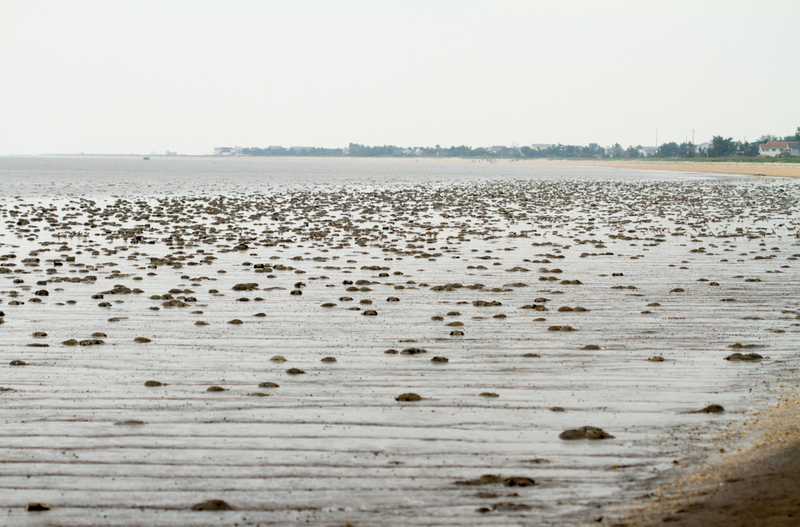 The birds gorge on the Horseshoe Crab eggs as well as various worms and invertebrates in the tidal flats and beaches. In their two to three week stopover, they may double of triple their weight, which fuels them for the remainder of their long flight. It was a privilege to sit on the beach with almost no one else around, watching and listening to this grand event. 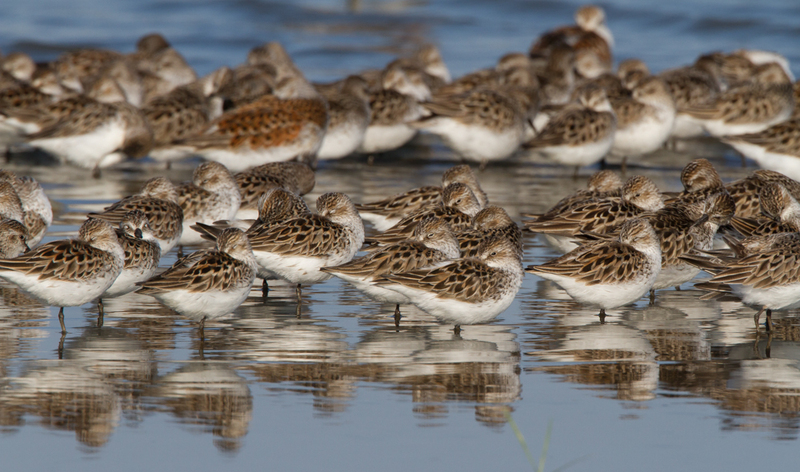 The migrants are made up of primarily four species: Semipalmated Sandpipers, Dunlins, Ruddy Turnstones, and Red Knots. The latter species is one facing steep declines in their population over the past decades. Researchers were on a distant beach the first afternoon of my visit as they have been for many years – capturing, weighing, and tagging Red Knots and other shorebirds to learn more about their needs in their perilous journey in the hopes of helping populations recover. An unusual and fun statue greets visitors to the DuPont Nature Center in Mispillion Harbor Reserve. It is a tribute to the most famous Red Knot, known as B95, for the bright orange leg band with that code attached by an Argentinian researcher in 1995. 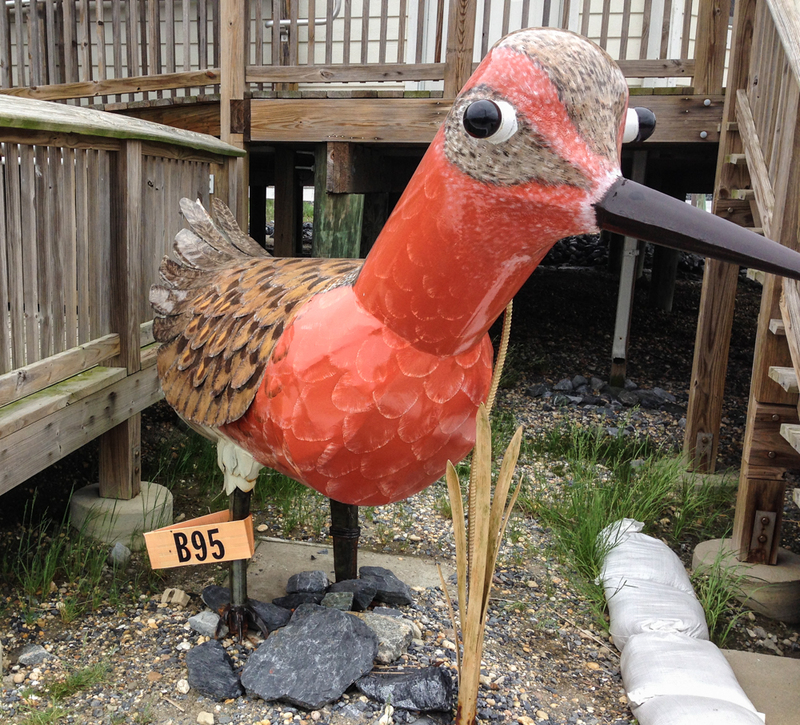 During my visit, news broke that B95 had been spotted once again in Delaware Bay. Scientists estimate this Red Knot to be 20 years old (it was already an adult when banded), making it the oldest Red Knot known. And because its annual journey from the tip of South America to the Arctic spans about 9,000 miles one way, in its lifetime, this amazing bird has flown a distance equal to going to the moon and halfway back. That feat has earned B95 the nickname, Moonbird, and it is the subject of an award-winning children’s book by the same name. During its lifetime, B95 has seen the population of his kind crash from over 100,000 birds to about 15,000 today. 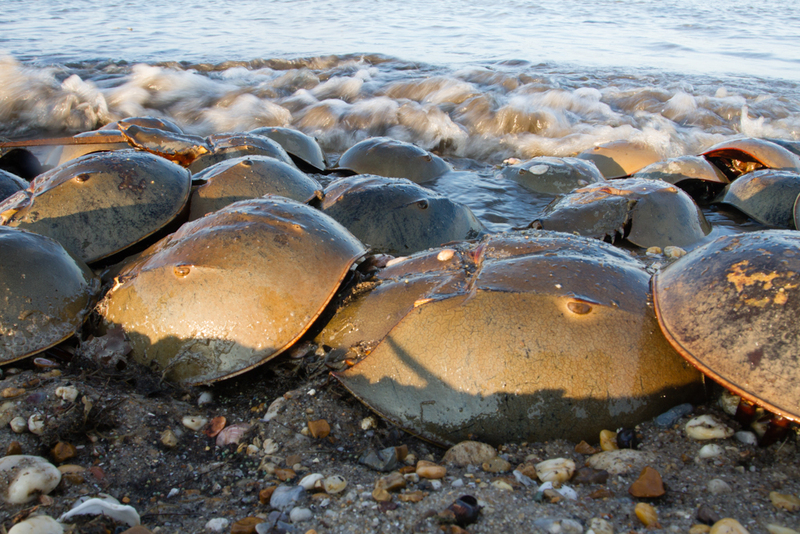 There are great concerns over the decline in Horseshoe Crab eggs due to over-harvesting of the adults crabs for bait and available habitat for both crabs and birds due to development. 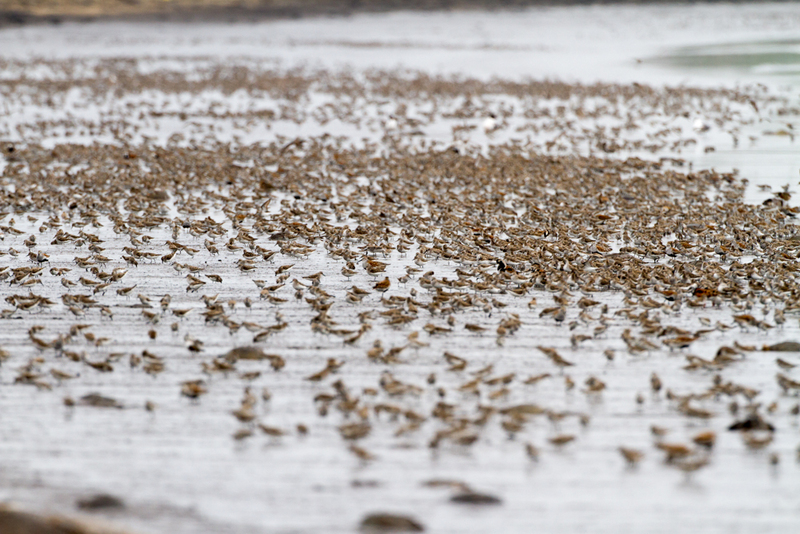 Red Knots were scarce during my visit and I spotted only a handful amongst the thousands of other shorebirds. And while the natural connections of Horseshoe Crabs are amazing, they also have important connections to humans. 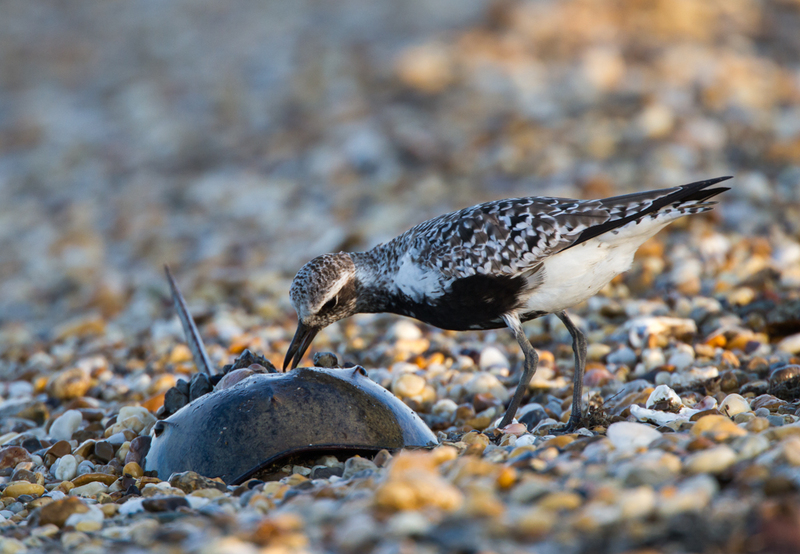 They have been used for food and fertilizer in earlier cultures, and are now harvested as bait for the eel and conch fisheries (regulations now restrict this harvest to ensure enough egg-laying adults to maintain the shorebird connection). Scientists have learned a lot about the human eye from studying the electrical impulses in the compound eyes of Horseshoe Crabs. And chitin from Horseshoe Crabs is used in the chitin coating of surgical sutures and wound dressings for burn victims. But the main human connection now comes form the creatures’ blue blood (their blood contains a copper-based respiratory pigment and turns blueish when exposed to air). An extract of the Horseshoe Crab’s blood is used by the pharmaceutical and medical device industries to ensure that their products (any intravenous drugs, vaccines, and medical devices), are free of bacterial contamination. 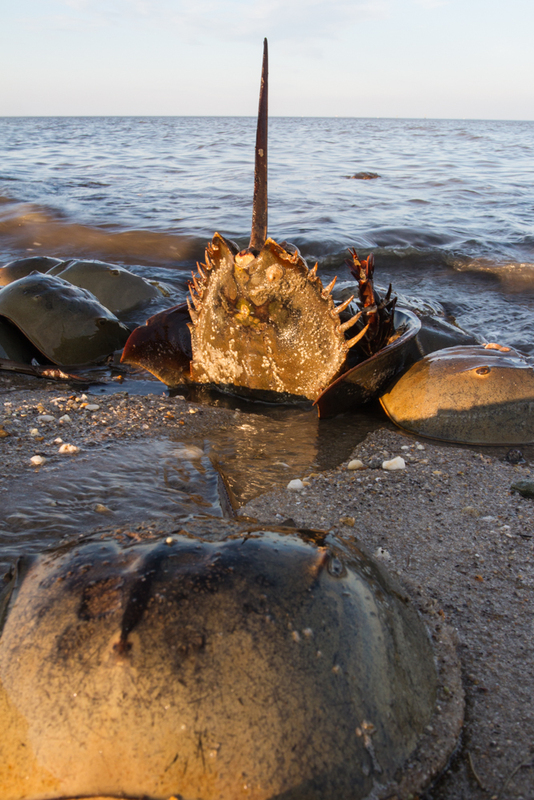 So, if you or anyone you know has ever been hospitalized, you owe a lot to Horseshoe Crabs. The experience at Slaughter Beach is something that I will never forget – the sights and sounds of thousands of Horseshoe Crabs clambering over each other at the tide line at sunset followed by tens of thousands of birds feeding on the eggs the next morning is one of the great wildlife spectacles in America. I recommend a stop at the DuPont Nature Center (http://www.dupontnaturecenter.org/index.html) if you are in that area. It has excellent displays on the incredible story of Horseshoe Crabs and the staff are very knowledgeable. You will come away appreciating these “living fossils” as much as I now do. Although it is a long drive from NC, I am considering offering a trip to this area in the future to witness this natural wonder. Let me know if you are interested. Okay, I admit it, I wasn’t that convinced that I would have a great natural history vacation in New Jersey. I had heard of the wilds of the Pine Barrens, but knew little of the rest of the state except what Jon Stewart and the southerners I grew up around joke about. I do know several folks from NJ (one even met up with me for this trip) and they love the outdoors like I do so maybe…Then I started reading The Freiday Bird Blog by Don Freiday about all of the great bird sightings around Cape May, NJ, so I decided to give it a try. The Garden State did not disappoint. 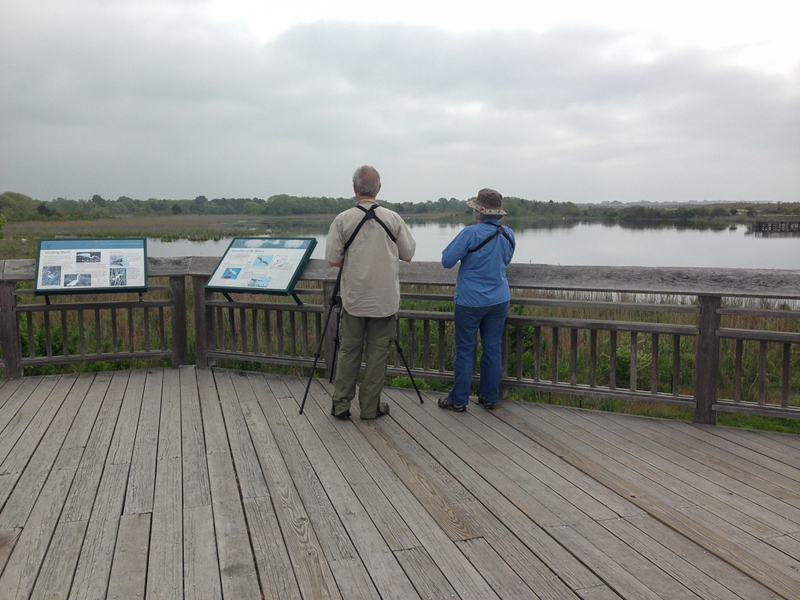 The first stop was Edwin B. Forsythe National Wildlife Refuge along the shores of southern New Jersey. Forsythe totals about 47,000 acres of mainly salt marsh wetlands and tidal coves and bays managed for waterfowl (especially Black Ducks and Atlantic Brant), migrating shorebirds and song birds, and other wildlife. The refuge has also created a series of fresh and brackish water impoundments to create a diversity of wildlife habitats. The easiest way to see wildlife is the popular 8-mile one way auto loop called Wildlife Drive. The loop passes by a series of impoundments in the middle with salt marshes along the outside and then finishes by passing through some forested habitats. 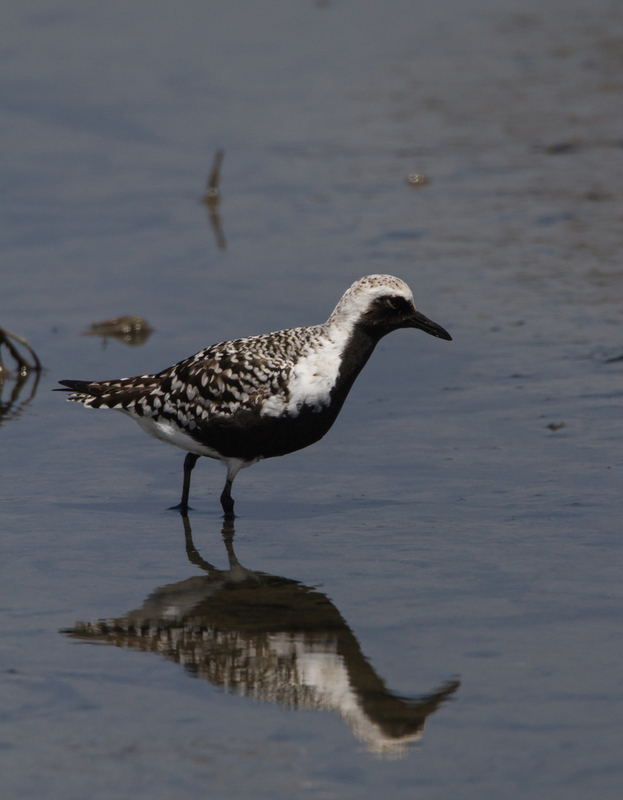 Last week was about peak numbers for the migrating shorebirds so there were great views of many species such as Semipalmated Sandpipers, Short-billed Dowitchers, and Black-bellied Plovers. A highlight was watching a pair of Black Slimmers feeding in the canal next to the road. Their strange bill, unusual feeding behavior, and striking colors make them one of my favorite coastal birds to watch. 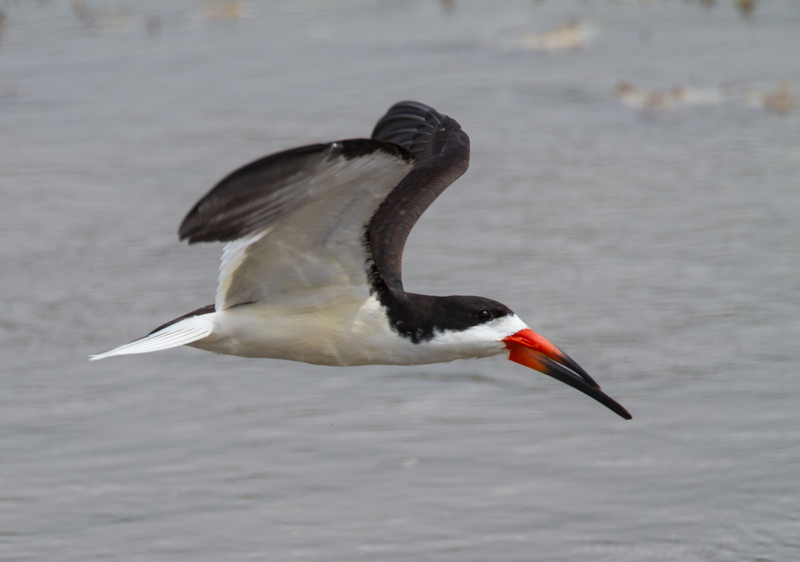 They drag the knife-like lower mandible of their bill through the water as they fly back and forth in search of prey. When the mandible touches a fish, the upper bill snaps down instantly to catch it. This bill is their most unusual feature – it is the only North American bird where the lower mandible is longer than the upper. At hatching, the two mandibles are equal in length, but by fledging, the lower mandible is longer than the upper. 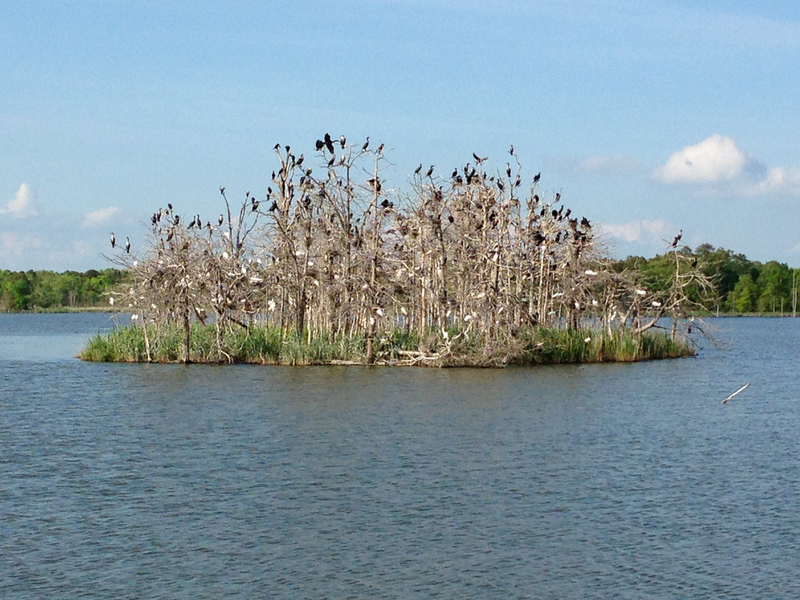 Next stop was Heislerville Wildlife Management Area which is renowned for its migrating shorebirds. Driving down the rutted dirt road it did not look promising, but up ahead a good sign – a group of people with spotting scopes. 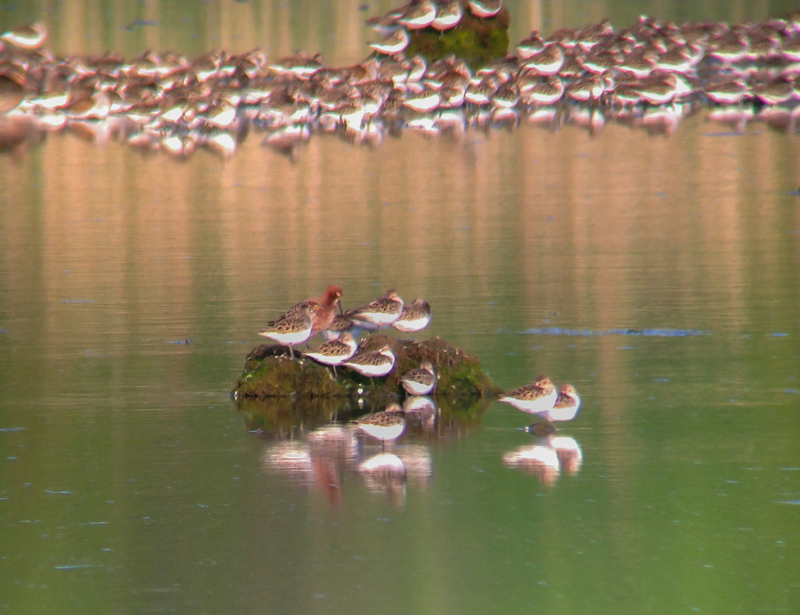 It was a Nature Conservancy outing scoping the tens of thousands of shorebirds for some unusual species. 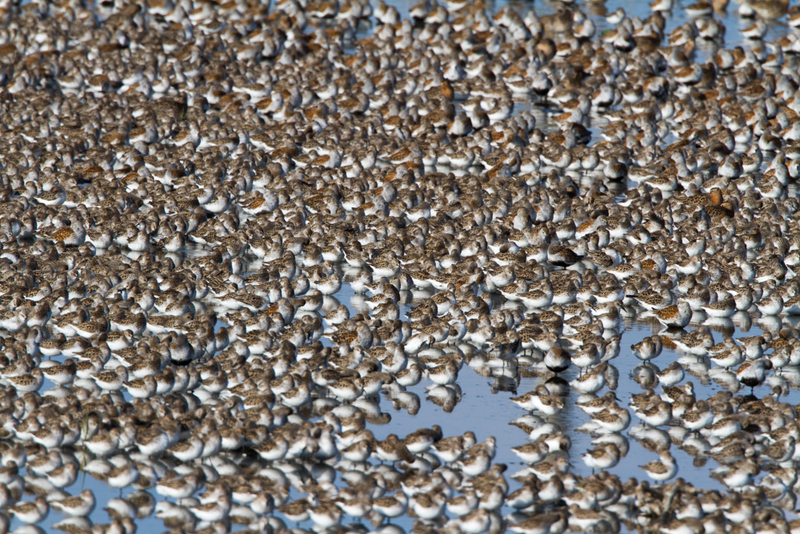 The vast majority were Semipalmated Sandpipers along with fair numbers of Dunlin and Short-billed Dowitchers. But the target of the day for the birders was a rare Curlew Sandpiper. This is a Eurasian species which nests on the tundra in northern Russia and winters in southern Asia, Australia, and Africa. But almost every year, a few end up somewhere along the coast of North America. 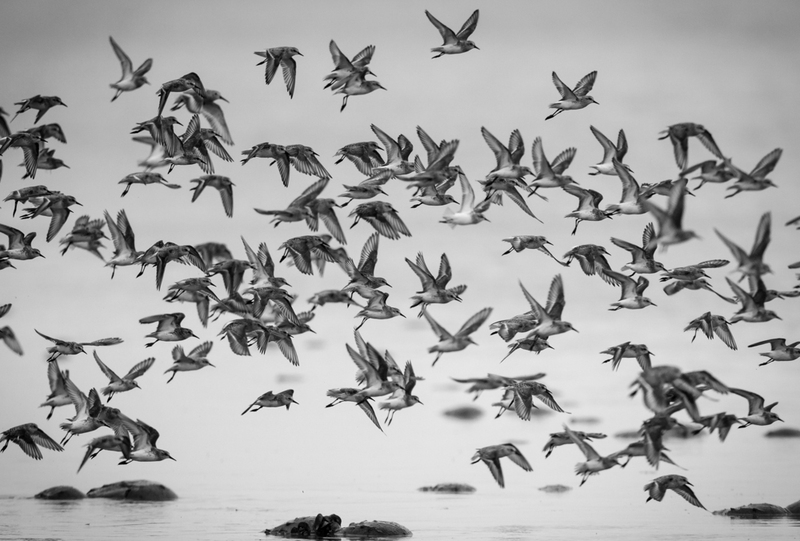 The Curlew Sandpiper had just gotten lost amongst the thousands of other shorebirds when we arrived. But on a second pass later that afternoon, a knowledgeable birder (turned out to be Don Freiday whose blog I follow) kindly pointed it out. Luckily, it was in its brick red breeding plumage so it stood out in the afternoon light even at a great distance through the scope. The second impoundment at Heislerville also contained thousands of Semipalmated Sandpipers and the low angle light made for some great photographs as the birds fed, preened, and rested. 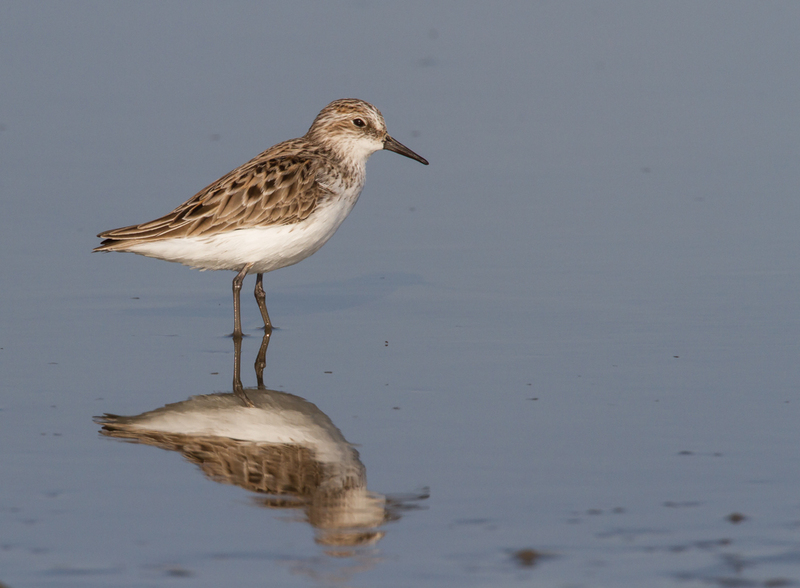 The Semipalmated Sandpiper gets its common name from the short webs between its toes (“palmated” means webbed). 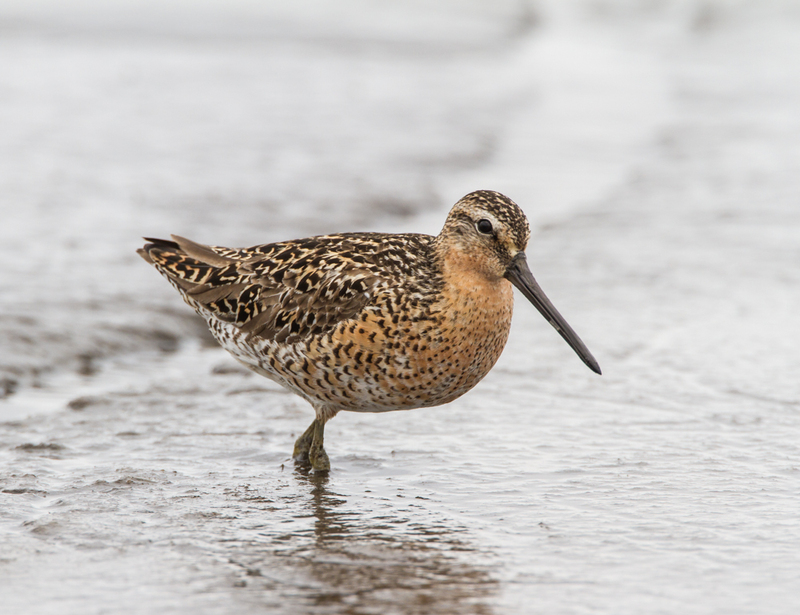 This species is by far the most abundant shorebird during migration in these parts – they spend the winter in South America and are now migrating the thousands of miles back to their Arctic nesting grounds. 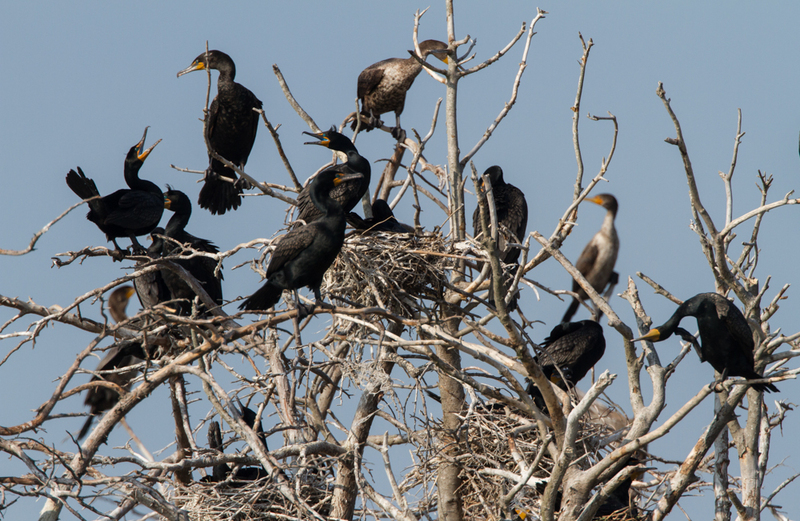 Adjacent to one of the shorebird impoundments at Heislerville was a small island containing a rookery of what seemed to be hundreds of nests of Double-crested Cormorants, Snowy Egrets, and Black-crowned Night Herons. The guttural squawks and other non-stop sounds made me appreciate my quiet neighbors back home. When viewed through the scope, I was amazed at the striking bright blue color of the throats of the Double-crested Cormorants. After a long day, I spent the night in the beautiful beach-side town of Cape May. The next morning was overcast and time was limited (had reservations on the ferry to Delaware in early afternoon) so I made several stops at local hot spots including Belleplain State Forest, Cape May NWR, and Cape May Point State Park. I’m sure it is different once the summer beach season gets rolling, but during migration, Cape May is like Disney World for birders. Everywhere you look there are people with binoculars and vanity license plates with some bird-related moniker. It should be no surprise that the World Series of Birding is held here every May. There were plenty of song birds in evidence although I think I missed the peak of warbler migration by a couple of weeks. 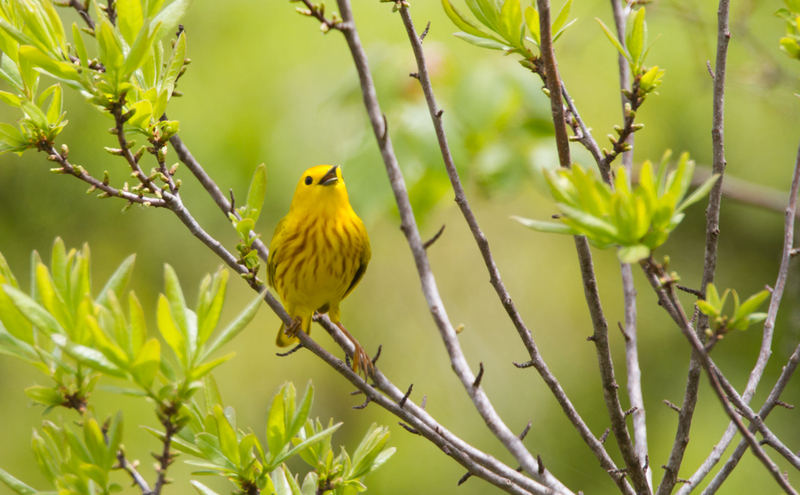 The most common warblers seen were the beautiful Yellow Warblers. They were feeding in the shrub thickets at almost every stop and offered good views as they sang and foraged. 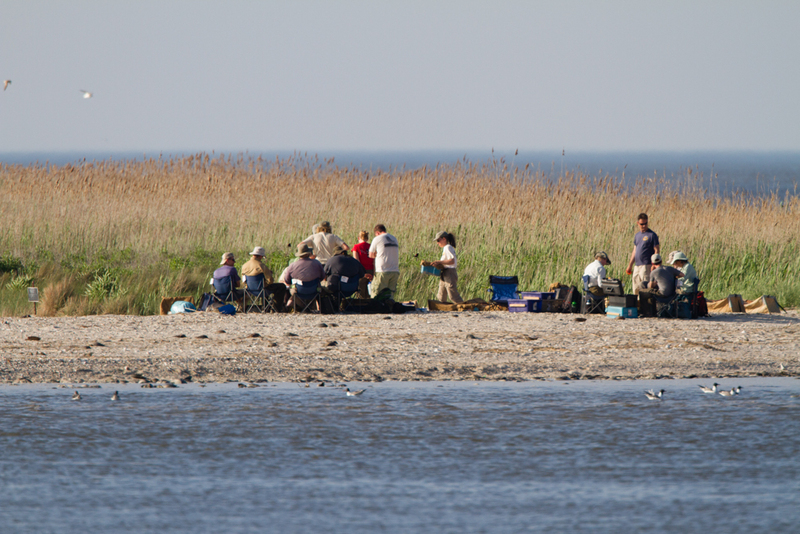 Cape May is indeed a birder’s paradise in spring. And they say the Fall migration is even more spectacular as thousands of song birds, raptors, and monarch butterflies gather at the point before heading across Delaware Bay on their way south. I guess I will venture to the Garden State again this Fall and see what all the fuss is about. 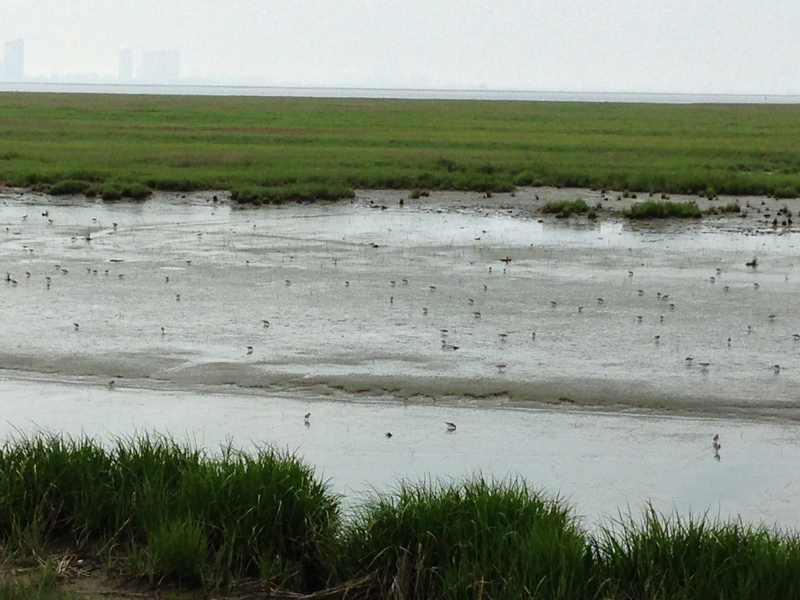 A quick post to share a highlight of the trip thus far to New Jersey, Delaware, and the Virginia Eastern Shore – huge flocks of shorebirds seen at Heislerville Wildlife Management Area in NJ. How many species can you see?